NGO News blog, NewsLine: Dr APJ Abdul Kalam’s birth anniversary celebrated in SEVAI Shanthi Matriculation Higher Secondary School, Pettavaithalai. 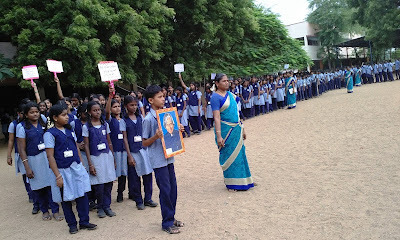 Dr APJ Abdul Kalam’s birth anniversary celebrated in SEVAI Shanthi Matriculation Higher Secondary School, Pettavaithalai. millions of children as well as grownups alike. He had encouraged and inspired anyone who interacted with him to dream big and work hard. Being a man who used to regularly meet school and college students, he felt that a country's youth had fewer biases and it would be easier to get them motivated. 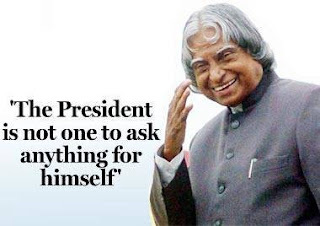 Beloved former president Dr APJ Abdul Kalam, also known as the father of India's military missile program, Kalam, who served as president from 2002 until 2007, was not only a renowned scientist, thinker, philosopher and teacher, but also a winner of numerous prestigious awards and honours was A bachelor, the former president was a 'Veena' player and was deeply interested in Carnatic music. He remained a vegetarian all his life. 'Wings of Fire', 'India 2020 - A Vision for the New Millennium', 'My journey' and 'Ignited Minds - Unleashing the power within India' are the famous books which Dr Kalam authored. These highly acclaimed books have been translated in many Indian languages. He was also honoured with 'Bharat Ratna' for his contribution to the scientific research and modernisation of defence technology in India. Beloved former president Dr APJ Abdul Kalam died on Monday after collapsing while delivering a lecture in Shillong, plunging the entire nation into a state of utter shock.-Kris.